Allergy Advice: Contains Egg, Wheat Gluten, Milk, Soybean. Ingredients: Vegetable Oil (Palm Oil, Rapeseed Oil), Egg, Sugar, Wheat Flour (Gluten) (14%), Whey Powder (Milk), Milk Powder (12%), Lactose (Milk), Emulsifier (E322) (Soybean), Flavouring. 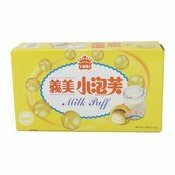 Simply enter your details below and we will send you an e-mail when “Milk Puff Biscuits (義美小泡芙 (牛奶))” is back in stock!